I know a lady who likes peanut butter and mayonnaise sandwiches. Lovely lady, but, seriously, peanut butter and mayonnaise?! Try and imagine that flavor combination without gagging. Ponder the sensation of crunchy and gooey, sweet peanut butter and whatever the hell mayonnaise tastes like. Now scourge it from your mind, because it’s disgusting, but remember how abrupt and startling this all was, and let’s get down to business. 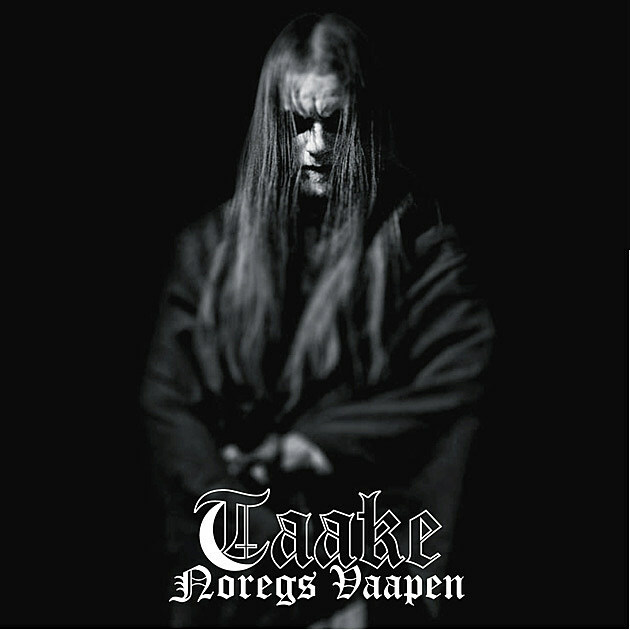 Taake are back with their fifth full length album, Noregs Vaapen. There’s really no interesting way to say this, but Noregs basically sounds like Taake always has. It’s melodic without being cloying, or losing the cold fury of good black metal. The self-titled preceding album was more black and less melodic – a stout rather than a porter – but Noregs restores the emphasis on melody. Taake has always striven to achieve the perfect balance between songcraft and atmosphere, and Noregs does not disappoint. Taake are some of the finest modern practitioners of what I call the “throw your hands in the air, wave ’em like you just don’t care” style of riffing. We all know the method: tremolo pick as fast as possible, throw the fret hand around the guitar neck until interesting melody patterns emerge. For post-Blizzard Beasts Immortal, add palm mutes. For Dissection, add some death metal and solos and a dash of murder. For early Emperor, bury the guitars under keyboards. Without the palm mutes and keyboards and what-not, the result of all that tremolo picking is Nattens Madrigal or Frost or Transilvanian Hunger. The old Norwegian bands have all moved on from that style of playing, but Taake take up the slack. If someone asked me whether the second wave style of black metal were still artistically or stylistically relevant, I’d direct them to Taake without any hesitation. The style is perfect, always was perfect, and there’s still buried treasure on the fret board for those with willpower and vision. Unfortunately, some bands ruin the style by aimlessly throwing their hands around the fret board, as if they could build songs by merely adding a few more chord changes to the proceedings. Hell, they might as well just wave their hands carelessly in their air, because that’s the extent of what they achieve. When second wave black metal is done wrong, it becomes a faceless froth of tremolo riffing. Done right – done Taake-style – it is a structured sprawl, but is never frantic. It attacks while remaining focused and stately, evoking feelings of anger and majesty rather than depression or melancholy. I should talk about the banjo solo now. Oh, I haven’t mentioned that yet? The banjo solo is on the fifth song, “Myr”. Peanut butter and mayonnaise sandwich! Jarring, isn’t it? Like PB&M, it makes me wonder about the thought process which culminated in such a bizarre combination. I don’t want to imagine somebody eating a PB&M, and I don’t want to imagine some corpsepainted Norseman, snus in mouth, sawed-off at his side, pluckin’ away at that thar banjer. The banjo bit is out of place, and doesn’t fit Taake’s tone and mood. It’s fun to listen to, entertaining, technically proficient even, but it just doesn’t work. The first time I listened to “Myr”, it was a shock, and that effect hasn’t decreased with distance and reflection. Nevertheless, give Taake kudos for trying it in the first place. Taake have used the mouth harp in the past, and it worked spectacularly well, so precedent does exist for this kind of experimentation. However, this year has seen a number of “what the … ?” moments. Revocation and their organ solo. Metallica recording with Lou Reed. Is heavy metal trying to get any last vestiges of crazy out of its system before the apocalypse comes in 2012? Ultimately, Noregs is in contention for black metal album of the year. It’s not quite a classic, and Taake have done better, but it’s still a fine addition to the band’s catalogue, peanut butter and mayonnaise moment and all.